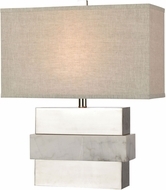 Transitional Table Lamps are that odd mixture of old and new, suitable for Grandma�s house or your nephew�s den. These unique, quaint, odd and comfy table lamps are that type of fixture you find everywhere. Uttermost Quoizel lead the way with a varied, eccentric collection of Transitional Table Lamps that will fit into most any home, somewhere in the house at least.